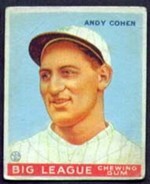 The 1933 Goudey set is a large series – 240 cards – loaded with historically significant cards. The set was also one of the first to be issued with chewing gum. It contains four Babe Ruths and two Lou Gehrigs. By far the most difficult card of the set to find is that of Napoleon Lajoie which was not distributed in packs but was only available through a mail-order promotion.